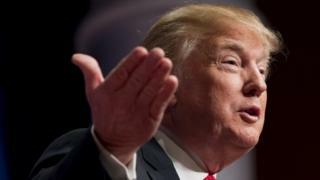 MPs are to debate whether to bar Donald Trump from entering the UK in response to a public petition calling for action against the US Presidential candidate. About 568,000 people have backed a petition calling on the tycoon to be barred for comments he made about banning Muslims from the US. Labour MP Paul Flynn will lead a debate in Westminster Hall on 18 January. David Cameron has condemned Mr Trump, who has major business interests in the UK, but said he should be allowed in. The Commons petitions committee decided to hold a debate on the issue after considering the matter at a meeting on Tuesday. Under the current rules, MPs have to consider any petition with 100,000 signatures for discussion in Parliament. The debate will be held in the Commons' secondary debating chamber rather than the full chamber and there will be no vote at the end of it. Helen Jones, the Labour MP who chairs the committee, said it would allow for "a range of views" to be expressed. "By scheduling a debate on these petitions, the committee is not expressing a view on whether or not the government should exclude Donald Trump from the UK," she said. "As with any decision to schedule a petition for debate, it simply means that the committee has decided that the subject should be debated." But Liberal Democrat leader Tim Farron questioned the decision to allocate parliamentary time to discussing Mr Trump. He tweeted: "Trump is a bloviating billionaire with downright offensive views. But I'd rather we debated inequality or the NHS." Mr Trump is currently the frontrunner, in some opinion polls, for the Republican nomination but he has been roundly criticised for comments he made about Muslims in the wake of December's fatal San Bernardino shootings - remarks which critics said were offensive and inflammatory. Home Secretary Theresa May, who makes decisions on banning orders, has said she cannot comment on the case. A rival petition opposing a ban on Mr Trump as illogical has been signed by nearly 40,000 people. This will also be debated by MPs. Could Donald Trump really be US president?